(Nanowerk News) Reaching out to “high five” someone, grasping and moving objects of different shapes and sizes, feeding herself dark chocolate. For Jan Scheuermann and a team of researchers from the University of Pittsburgh School of Medicine and UPMC, accomplishing these seemingly ordinary tasks demonstrated for the first time that a person with longstanding quadriplegia can maneuver a mind-controlled, human-like robot arm in seven dimensions (7D) to consistently perform many of the natural and complex motions of everyday life. Jan Scheuermann, who has quadriplegia, brings a chocolate bar to her mouth using a robot arm she is guiding with her thoughts. Researcher Elke Brown, M.D., watches in the background. 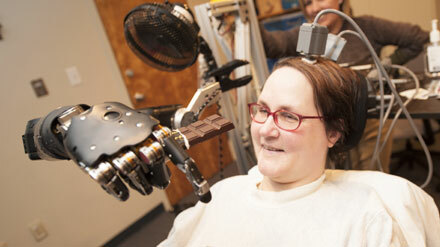 In a study published in the online version of The Lancet ("High-performance neuroprosthetic control by an individual with tetraplegia"), the researchers described the brain-computer interface (BCI) technology and training programs that allowed Ms. Scheuermann, 53, of Whitehall Borough in Pittsburgh, Pa. to intentionally move an arm, turn and bend a wrist, and close a hand for the first time in nine years. In 1996, Ms. Scheuermann was a 36-year-old mother of two young children, running a successful business planning parties with murder-mystery themes and living in California when one day she noticed her legs seemed to drag behind her. Within two years, her legs and arms progressively weakened to the point that she required a wheelchair, as well as an attendant to assist her with dressing, eating, bathing and other day-to-day activities. After returning home to Pittsburgh in 1998 for support from her extended family, she was diagnosed with spinocerebellar degeneration, in which the connections between the brain and muscles slowly, and inexplicably, deteriorate. A friend pointed out an October 2011 video about another Pitt/UPMC BCI research study in which Tim Hemmes, a Butler, Pa., man who sustained a spinal cord injury that left him with quadriplegia, moved objects on a computer screen and ultimately reached out with a robot arm to touch his girlfriend. Before three months had passed, she also could flex the wrist back and forth, move it from side to side and rotate it clockwise and counter-clockwise, as well as grip objects, adding up to what scientists call 7D control. In a study task called the Action Research Arm Test, Ms. Scheuermann guided the arm from a position four inches above a table to pick up blocks and tubes of different sizes, a ball and a stone and put them down on a nearby tray. She also picked up cones from one base to restack them on another a foot away, another task requiring grasping, transporting and positioning of objects with precision. In addition to Drs. Collinger, Tyler-Kabara, Boninger and Schwartz, study co-authors include Brian Wodlinger, Ph.D., John E. Downey, Wei Wang, Ph.D., and Doug Weber, Ph.D., all of PM&R; and Angus J. McMorland, Ph.D., and Meel Velliste, Ph.D., of the Department of Neurobiology, Pitt School of Medicine. The BCI projects are funded by the Defense Advanced Research Projects Agency, National Institutes of Health grant 8KL2TR000146-07, the U.S. Department of Veteran’s Affairs, the UPMC Rehabilitation Institute and the University of Pittsburgh Clinical and Translational Science Institute.